Valentine’s Day, and not a whole lot of love in the Middle East, as clashes between government forces and protestors broke out in Bahrain, Iran and Yemen. Washington, as usual, did nothing right. After hemming and hawing through the widespread Egyptian uprising against staunch US-backed dictator Hosni Mubarak, the Obama administration leaped at the opportunity to support the Iranian demonstrators…and completely ignore those in Yemen and Bahrain. Secretary of State Hilary Clinton spent the weekend spinning her perspectives on Al Jazeera, Al Arabiya and the US-funded Al Hurra, calling for political change in Iran, and openly supporting the aspirations of protestors there. Not a word on protests in US-backed Bahrain or Yemen however. It is clear that Washington is irritated by Iranian government claims to have inspired the uprisings embroiling the Arab world right now, especially as these are taking place in countries the US once relied on to support its pro-Israel, anti-Iran regional policy positions. But to actually come out in firm support of protestors in Iran, while remaining quiet about those taking place against their proxy Arab governments is also extremely hypocritical. It seems we never learn. Worse yet were the media takes on events in Iran on Monday. With all the tweets and videos pouring in, there is still barely any verifiable information available – not that this has stopped both print and television media from jumping into the fray. Iranian police also claimed that one person was killed and nine members of security forces injured by members of the outlawed Mujahedeen-e Khalgh (MEK), which is listed on the State Department’s list of terrorist groups. It looks, thus far, like all accounts of killings are originating from government — and not opposition – sources. And nobody seemed to have any sense of the size of the protest crowds hitting the streets. Even here on The Huffington Post, some eagle-eyed readers may have noticed the switch in the headlines from “tens of thousands” to “hundreds of thousands.” A number of media sources switched to characterizing the crowds as in the hundreds of thousands when the Financial Times stated so later in the day. But a quick look at the FT article shows that they do not source that number from any credible information — as far as we know, they could have picked it up from a blogpost. Videos posted on blogs and media websites cannot be readily accepted as evidence of events or crowd sizes either – there is little ability to distinguish between those taken during the 2009 post-election protests and Monday’s activities. Egypt and Tunisia did not have readily available footage of massive protests from recent years, so it was much easier to accept those coming out of Tunis and Cairo as authentic. Many are pointing to the language used by demonstrators — references to Mubarak, Egypt and Tunisia suggest a present day protest. But even pro-opposition live bloggers on Tehran Bureau and EA Worldview caution that these may have been edited and that verification remains difficult. Meanwhile, in Bahrain we have actual new video footage of Bahraini forces shooting at crowds from close range AND photo evidence of at least one dead civilian, both acknowledged by government sources. 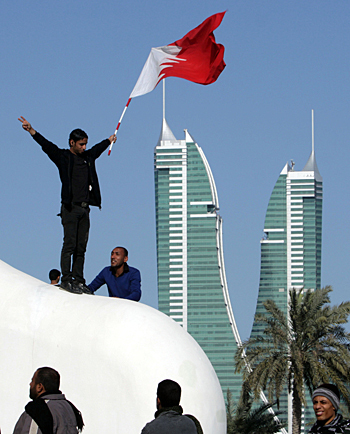 Today, Bahrain erupted again when ten thousand people streamed into Manama’s Pearl Square “galvanized” by the death of a protestor on Monday and another on Tuesday. The silence from the Obama administration is resounding. The choices we make in the Middle East simply astound me. While all sorts of theories abound about why the region is spawning one revolution after another this year, I place my hat firmly in the “honor and dignity” camp. Writing about this even before Tunisia hit our headlines in January, I argued that popular Arab “worldviews” have long been ignored by most of their governments. So although there is a deficit of representative government and an abundance of corruption and political/economic disparities in many of these countries, the Arab nations currently under fire have mainly been US-backed governments that have practiced our policy “double standards” in the Middle East. These US allies are Tunisia, Egypt, the Palestinian Authority, Yemen, Algeria, Jordan, Bahrain and others likely yet to emerge. But those waiting for the Tunisian/Egyptian model of regime change to take place in Syria, Iran, Oman and Qatar can think again – protests in these countries would represent a whole other trend. Right now, the long-simmering regional rage is exploding over regimes that collaborated with the US’s policy initiatives for Israel, against Palestine, for Iraq, against Iran, for Israeli nukes, against Arab/Iranian nukes. These “degradations” rose to the surface with the convergence of 1) WikiLeaks revelations about their leaders and our policies, 2) the death of the US-sponsored 20-year Peace Process, and 3) the relatively new phenomenon of Arabs actually having access to this information — via Al Jazeera, Twitter, Facebook and the blogosphere. What’s With the Iran Focus Then? So I eagerly awaited the planned demonstrations on February 14 in Iran to see if this theory still holds or if protests in the Islamic Republic will shatter this trend. It looks, thus far, that whatever transpired in Iran on Monday does not have the legs to carry it into day two. But that will almost certainly not stop Washington’s determination to wring a revolt out of its biggest regional foe. We can try to do so to our own detriment. After decades of policy double standards, devastating invasions/wars, failed diplomatic and sanctions initiatives, and now the nail-in-the-coffin decision to veto the upcoming UN Security Council resolution on Israel’s illegal settlements, our intervention anywhere in the region will not be welcomed. Washington only helps the Iranian government when it steps into the ring. MR. CROWLEY: Well, actually, in the other countries there is greater respect for the rights of the citizens. Furthermore, we still do not recognize that, for all its many shortcomings, the Iranian government still remains one of the more representative governments in the Middle East – its “worldview” popular both domestically and regionally – and that charges of electoral fraud after the June 2009 elections are far from conclusive. So Washington can pull out all the stops it wants, but is unlikely to see the same kind of widespread uprisings throughout the Islamic Republic, in the same way we witnessed in both Tunisia and Egypt. But it will try nevertheless.